GSUSA® feels that this product was infringing on their intellectual property. In response, we are discontinuing this product. Supplies are limited. 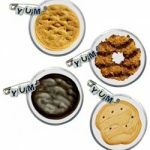 14 reviews for "Cookie Booth Patch"
These were just perfect for our needs. Our requirements on incentive plan for cookies changed and the girls were disappointed when they didn’t get a patch. The girls were so happy with these cute patches! I ordered for my Daisies. The Junior scouts saw it and wanted one also. Unfortuantely they are out of stock. So I guess everyone was as pleased as I was with the patch. 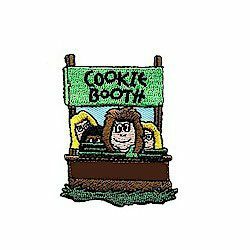 We received the cookie booth patch and they are sooooo cute!!! Cute,colorful patch. All the girls and Mom’s loved it! I received the patches on time and they were exactly as advertised! Love the patch -little large but super cute ! I love the cute patches and the great prices. I usually get patches sowed on but know a lot of people who prefer iron-on. Love the patch design but when I saw them, thought “someone will be annoyed with me that it’s not iron on”. Love the patch but hope they update with iron-on or disclaimer about having to sew on or get patch adhesive. 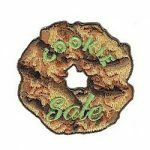 This is one of the cutest fun patches for cookie sales that I have ever purchased for my girls. They love it! Everyone who has seen our girls with this patch has asked where we got it. Highly recommend it!! 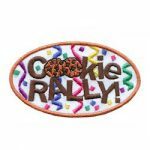 The girls worked hard at their cookie booths and this was the perfect “fun badge” to celebrate how well they did talking to customers and selling beyond our cookie goal. Love them….and as always delivered just in time!